For those of you out there with shoulder problems, this is for you! The shoulder joint (Gleno-humoral joint specifically) can be broken down into a couple very simple components: bones, Static stabilizers, dynamic stabilizers and prime movers. In this article I will be describing the anatomy of the shoulder joint specifically. The AC and Scapulothoracic joints will be described in another article. Its important to understand they all work together to function as a whole but today we will focus on the micro and save the macro for later. This is a good illustration of the size difference between the two surfaces meant to articulate. The bones to consider in the shoulder are the Humerous and the Glenoid (the lateral most part of the scapula, similar in shape to the top a golf tee). To look at these bones without all the surrounding tissue one might think they don't go together. The best comparison I've heard is a golf ball (Humerus) and a golf tee (glenoid). The joint itself isn't very stable based on how the bones come together. Perhaps this explains why so many folks experience shoulder dysfunction and pain. The Static stabilizers are the next group to consider. They are simply named the Anterior, superior, inferior and posterior glenohumeral ligaments. They essentially are the joint capsule for the glenohumeral joint. They attach to the labrum in their respective places, as named, and responsible for keeping the glenoid and humerus in close proximity for movement. The important aspect to consider about these structures is that they are entirely passive. They have no dynamic or active capacity in the stability of the shoulder. They do exhibit a small amount of elastic quality but no contractile quality without some prestretch. So when it comes to improving the stability of the shoulder there is no exercise that will affect these guys directly. The best medicine for the static stabilizers is rest, hydration, an anti-inflammatory diet and surgery if it gets too bad. 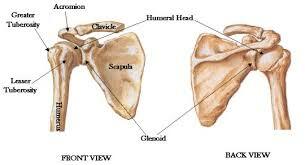 For those curious about the labrum, the labrum is more of an extension of the glenoid. A "cone of shame" if you will (think of your post-op puppy, haha, poor fella) that increases the surface area of the glenoid for increased stability. Supraspinatus is for abduction. Teres minor and Infraspinatus help with external rotation while opposing internal rotation. Subscapularis is for internal rotation while opposing external rotation. Dynamic stabilizers are the muscles used to pull the Humeral head tightly onto the glenoid at the initiation of arm movement. They are the "Rotator Cuff" aka The S.I.T.S. muscles: Supraspinatus, Infraspinatus, Teres minor and Subscapularis. Due to they're location, size and attachments they aren't capable of generating large movements of the shoulder. Nor are they capable of creating much force. This means if you're trying to strengthen any of the rotator cuff muscles and you're using more than a couple pounds of weight...... you're not working the rotator cuff! In many cases of shoulder injury or pain, there is an imbalance in the rotator cuff muscle activation. There could be a timing issue, a force of contraction, or even no activation at all of the muscles. Sometimes the Prime movers of the shoulder will overshadow and assume the role of any one of the rotator cuff muscles and keep the rotator cuff from doing its job. It's kinda like having a baseball team where the pitcher tries to field all the ground balls instead of the infielders. A list of the prime movers of the shoulder and the motion they create. I bring this up today because I see many people, talk to even more outside the office, on a weekly basis with shoulder pain. I see the frustration of those who opt for the quick fix (surgery, pills etc.) when the shoulder remains dysfunctional and painful 6 months following the intervention. I've seen the folks that CHOOSE to properly rehab the shoulder as a whole instead of one muscle at a time and without fail the later are rewarded tenfold for their efforts. It's not a quick fix, but anything that comes quickly and without effort generally doesn't stay long either. If you're one of the many living with shoulder pain every day. Schedule a free movement screen with us and let me show you exactly what's wrong. With the help of either the Functional Movement Screen or Selective Functional Movement Assessment we can isolate the root cause of your pain and dysfunction. Once The cause has been established we can then utilize any number of Dynamic Neuromuscular Stabilization exercises to not only target proper muscle activation but create new movement patterns that ensure long-term stabilization in the shoulder or any joint, for that matter. I hope you've gotten at least one thing from this article and as always if you have any questions I'm but a phone call away and a complimentary 15-minute consultation can be booked from this website, without obligation, anytime. Have a good day and stay tuned for more info about other joints of the body.